Jason Kaplan Anna Maria Ponzi manages vineyard operations, including its elegant and spacious tasting room. When it comes to Oregon’s hospitality-and-tourism industry, a woman’s place is in the lead. Before she became President and CEO of the Central Oregon Visitors Association, Alana Hughson was the hardworking daughter of innkeepers running B&Bs in Aspen, then Bend. Alana Hughson, president and CEO of Central Oregon Visitors Association, joined the organization 25 years ago. Anna Maria Ponzi can relate. Today, she’s President at Ponzi Vineyards, but she grew up an Oregon farmgirl, working the land of her family’s 12-acre Sherwood vineyard in an era well before tasting rooms, when cool-climate wines were still an unproven commodity. Switching linens, serving meals, tying down vines—it’s all in a day’s work when the family trade is hospitality and tourism. Hughson and Ponzi have long since grown, and so has the travel-and-tourism industry. 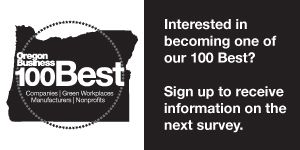 It generated $11.3 billion and 109,000 jobs for Oregonians in 2016, according to a recent Dean Runyan Impact Study, and they’re good ones: those who begin their careers in tourism command average career salaries of $81,900, well above the national career average, notes a recent U.S. Bureau of Labor Statistics study. Hughson and Ponzi work at the fore of this thriving Oregon industry, but each woman took a few instructive detours on her way. Hughson came to COVA 25 years ago after a decade-long policy work stint in Washington, D.C., and quickly realized marketing destinations isn’t so different from marketing legislation: it’s all about convening. Central Oregonians are entrepreneurial, says Hughson, which has made it easier to rally residents around forward-thinking funding initiatives and infrastructure—things like lodging taxes and a thriving regional air service—as the area grows. At Ponzi, Anna Maria and her sister, Luisa, currently manage 130 acres of vineyard (Anna Maria heads operations, Luisa makes the wine) and they’ve got company, with around 700 neighboring wineries now populating the Northern Willamette Valley alongside Ponzi. Luisa Ponzi develops Ponzi Vineyards’ wines. Brand stories are paid content articles that allow Oregon Business advertisers to share news about their organizations and engage with readers on business and public policy issues. The stories are produced in house by the Oregon Business marketing department. For more information, contact associate publisher Courtney Kutzman.